Research has shown that music, art, and math are all linked skills. Jessica Peresta from The Domestic Musician believes that music is one of the fundamental classes for students. She has a bachelor’s degree in music education and a strong commitment to music education. The site includes videos and resources all online and catered toward parents, teachers, and students. Catering toward school children, the site really can be used for any age though. Not having piano during his grade school years, my husband has decided it would be a fun activity. My middle took piano years ago (violin didn’t sound like the words), and we still have the old heavy piano taking up space. We have a few pianos around our house, both electric and our large old wood piano. The piano in our entryway is a hand me down from cousins that we have threatened to sell with our house ever time we moved. The piano itself was a large upright that was originally cut down to make it shorter. If you lift the top cover you can see the marks where each string was shortened. By shortening the string and adjusting the tension, the piano can be tuned to make the same sound. We now have a few keys that don’t work, but the piano has followed us as we have moved from location to location. With peeling paint and using the old bench from an organ that I learned to play in grade school, it has survived and is now being used by my husband. 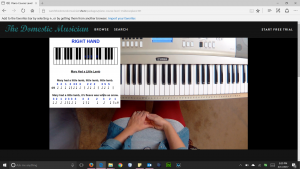 Lessons on the Domestic Musician are set up as videos with a work at your own pace layout. The first lesson worked through proper posture, having the right bend to the fingers, and playing a short song first using basic finger moves. My husband has been trying to learn piano as part of his slowing down and moving toward retirement. He has been working at teaching himself through piano books and youtube videos found online. 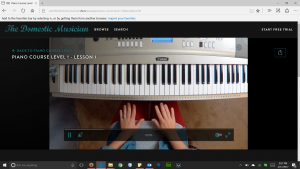 The Domestic Musician site is geared toward teaching children for homeschool and classroom environments for many of the offerings but her piano classes do translate well for any age. I don’t think any children regret as adults having taken piano, but I do think many kid’s bemoan lesson and practice time while doing it as a child. I suspect my husband was out riding a bike whereas I was in taking lessons. 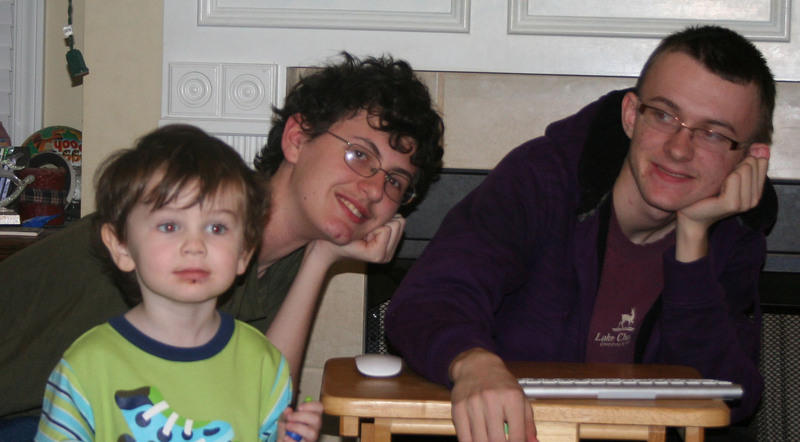 Personally I had asked for piano lessons as a tween – ending up with organ lessons taught by cousin. A cousin who probably had lots of stories and bemoaned teaching me through the whole period of time she taught me. But I can’t say I regret taking lessons at all. Online lessons lack the ability of the teacher to interact and ‘react’ to the student’s flaws and actions, but on the other hand the flexibility that opens up of anytime, anyplace is wonderful. It also frees mom up to do whatever is needed while lessons go on as opposed to sitting in the other room trying to get things done while lessons occur. Or like me while my older children took lessons, sitting in a car while lessons occurred after our one hour drive to lessons and sending one child in at a time while others did homework. My oldest took harp, and finding a teacher nearby had been impossible! Most universities teach a class on the science of sound. The class is usually taught through the physics department and filled with both physics majors and music majors. Sound is everywhere around us! Everywhere from a hum to the loud noises of a jet plane. Sound can even be harmful at high enough levels. If you have ever tried a dog whistle you have noticed that some sound can’t be heard by human ears. I’ve also got an app for testing hearing that allows me to see what levels of sound I can no longer hear. As kids the old CRT monitors would make an almost painful noise that parents can’t hear. – I’ve actually heard of ringtones in the level that kids can hear but adults can’t. I haven’t heard them though…. Sound is actually a wave. It behaves similar to the waves in water, only our ears pick it up. The Explorium website has a cool website on the science of sound. Information about Acoustics and the science of sound can also be found on many sites. The physics classroom is one I like! 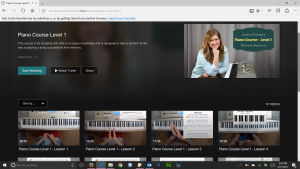 Enter “TDMPIANOSALE” for 25% off the course! for a music education subscription.